A healthy 2013 season went a long way toward restoring Jacoby Ellsbury's free agent value. He bounced back from a lost 2012 season to re-establish himself as one of the game's elite leadoff men and center fielders, and agent Scott Boras surely expects a contract well north of $100MM. Ellsbury is known for his blazing speed, and he led all of baseball with 52 stolen bases this year. He previously picked up the American League stolen base crown in '08 and topped MLB in '09. He has a strong career stolen base success rate of 84%, and was up near 93% this year. FanGraphs' baserunning stat, which includes steals and a bunch of other baserunning skills, suggests Ellsbury was worth 11.4 runs on the basepaths this year. That figure was the best in baseball. To make an impact on the bases, a player needs first to reach base, and Ellsbury does well there with a .350 career OBP. He has a high contact rate and a .297 career batting average, and draws enough walks to supplement his hits. Ellsbury also has more pop than the typical center fielder, with a career slugging percentage of .439 and isolated power of .141. While his power is more of the doubles and triples variety, which is aided by his speed, he did hit 32 home runs in 2011. As Baseball HQ likes to say, once you display a skill, you own it, so it's fair to say Ellsbury has the potential for double digit home runs. That 2011 season looks amazing on a resume, as Ellsbury led all of baseball with 9.1 wins above replacement. He finished second in the AL MVP voting, won a Silver Slugger and a Gold Glove, and made the All-Star team. Defense is another strong suit for Ellsbury. He won a Gold Glove in 2011 and has consistently posted above average UZR and DRS numbers in center field. Ellsbury adds value in every conceivable way. This year FanGraphs had him at 5.8 wins above replacement, a level of production a team might value at $30MM or more. Ellsbury's WAR ranked second only to Robinson Cano among free agents. Ellsbury will play next year at age 30, which is considered young for a free agent. Ellsbury already has lost two seasons to injury in his career. He played only 18 games in 2010, fracturing multiple ribs after colliding with Adrian Beltre in April. Two years later, he collided with Reid Brignac while sliding into second base and ended up playing only 74 games due to a shoulder injury. "Jacoby Ellsbury is a very durable player. He just has to make sure that people don’t run into him," Boras told reporters in July. There may be an element of truth to that, but most people in the game would not use the word "durable" to describe Ellsbury. Ellsbury didn't run into anyone this year, but he was still limited to 134 games due to a groin injury, a sore wrist, and a compression fracture in his right foot. He was on the field for the postseason, playing in all 16 games despite a nagging hand injury first reported by Ken Rosenthal of FOX Sports. There is a belief around baseball that speed doesn't age well, and Ellsbury's game could suffer if he loses a step. While Ellsbury is not as reliant on infield hits as he used to be, they still comprised about 14% of his total this year, according to Baseball-Reference. His 7.4% walk rate this year, while a career best, is nothing special. Ellsbury's OBP could come down as he loses speed, more so than with the average player. And of course, speed is a big factor in center field defense. A left-handed batter, Ellsbury wasn't much of a threat against southpaws this year, posting a .246/.323/.318 line in 237 plate appearances. 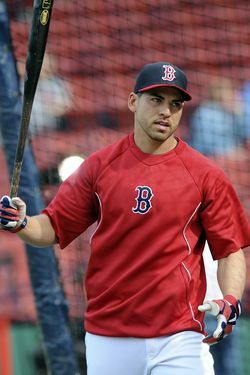 Ellsbury is a lock to receive and turn down a qualifying offer from the Red Sox, so signing him will require a team to forfeit its highest available pick in the 2014 draft. Ellsbury was born and raised in Madras, Oregon, and the town threw a parade for him in 2007. He met his future wife Kelsey while they were attending college at Oregon State. According to the Red Sox media guide, Ellsbury is believed to be the first Native American of Navajo descent to play in MLB, and he's proud of his heritage. This year he conducted the Second Annual N7 Jacoby Ellsbury Baseball Camp at the Salt River Fields at Talking Stick in January, with 130 kids in attendance. Ellsbury loves basketball and played in high school, along with football and of course baseball. He played on travel teams and became friends with current Athletics infielder Jed Lowrie. The two players were drafted 22 picks apart in 2005 and were teammates for many years in the minors and Majors. The Red Sox have made efforts to sign Ellsbury in the past, and will at least have conversations with Boras. Otherwise, any team with some payroll space that doesn't have an elite center fielder in place will be approached, including the Rangers, Mariners, Yankees, Mets, Phillies, Nationals, and Cubs. I'd throw the Tigers in that mix, but that could be tricky for Boras since center fielder Austin Jackson is another one of his clients. Ellsbury is an ownership level discussion, and Boras has those connections, so it doesn't necessarily matter if the GM approves. In September, Boras explained at length to Jon Heyman of CBS Sports why Ellsbury is better than fellow speedy outfielder Carl Crawford. Boras generally has huge expectations for contracts for his elite free agents, and I think he expects to top Crawford's seven-year, $142MM contract from three years ago. Boras has secured eight, nine, and ten-year deals before, and he's probably thinking eight or nine years for Ellsbury as a starting point. I think there's a chance a team springs for eight, especially if that knocks down the average annual value a bit. Crawford fell short of $21MM a year, and I think Boras can get $20-23MM per year for Ellsbury. Ultimately, I predict a seven-year, $150MM deal.